Tryptophan metabolism plays an important role in immune modulation and neurodegenerative disease. Tryptophan metabolizing enzymes are important drug targets for cancer immunotherapy and neurodegenerative disease. For high-throughput screening of tryptophan metabolizing enzymes, we have developed NFK GreenScreen™ assays for screening indoleamine 2,3-dioxygenase (IDO1) and tryptophan dioxygenase (TDO). 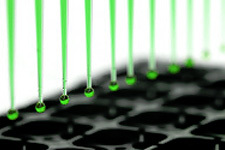 The NFK Green™ assay works under mild conditions and is suitable for high-throughput screening. NFK GreenScreen™ kits contain all components to perform the assay, including reference inhibitors. Dose response curves of reference inhibitors for IDO1 and TDO measured with NFK GreenScreen™ are shown here below. Compared to the current assay standard for IDO and TDO testing NFK GreenScreen™ assay conditions are mild (ambient temperature and neutral pH) avoiding heating and addition of very acidic, basic, or toxic reagents. The fluorescence assay is based on a highly specific and unique label, developed by NTRC, named NFK Green™. The protocol allows a rapid implementation of the assay for high-throughput screening or regular compound testing. The suitability for high-throughput screening was demonstrated by separate screens for IDO1 and TDO screening around 90.000 compounds in 384- or 1536-well format. All compounds were screened at a concentration of 10 µM. Depending on your needs we can offer kits for 1,000 or 10,000 data points. For high-throughput screens (>100.000 data points) we can offer you protein, reagents and buffers customised to your screen. We have demonstrated that the reagent can be used to detect NFK in biochemical assays of IDO1 and TDO. Moreover, the assay can be used to measure capacity of cells to metabolize tryptophan, and thus to determine the cellular potency of IDO1 and TDO inhibitors. Biochemical assays for IDO1 and TDO were developed to be ‘addition-only’. First, compound and enzyme are combined. Next, the reaction is started by addition of L-tryptophan. After 10 or 30 minutes, the reaction is stopped by the addition of NFK Green and developed by incubation at 37 °C for 4 hours. NFK Green™ reacts with NFK to form a green fluorescent molecule, with an excitation wavelength of 400 nm and an emission wavelength of 510 nm, where fluorescence interference of library compounds is minimal. The assay can be read on all commonly used fluorescence or multimode readers and is suitable for biochemical as well as cell-based assays to measure tryptophan metabolizing enzymes. For more information and request for a quotation, please send an e-mail to services@ntrc.nl.